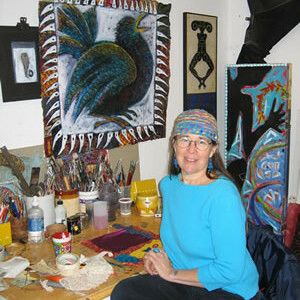 Jill Gussow is a mosaic and mixed media artist based in Rochester, NY. She holds a B.F.A from Cooper Union and a M.F.A from Rochester Institute of Technology. She has exhibited her work in California, New York City and Sao Paulo Brazil. She has taught painting, drawing and photography at RIT, University of Rochester, SUNY Brockport, Strong Museum, Monroe Community College, and St. John Fisher. She has also taught workshops and has lectured across US as well as in Brazil and Jamaica. Gussow lives and works in Rochester, NY.